Today was our day of rest. There were no work projects or responsibilities scheduled but we felt the absence of the children. The streets of San Andreas Sajcabaja greeted us warmly after our bowls of oatmeal and fresh cut fruit. 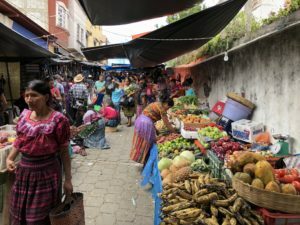 We slung our bags over our shoulders and put the local denominations called quetzales into our pockets to shop from the weekly market. We were encouraged to barter with the locals as a sign of honor because we were entering into their culture. There were lots of vendors cooking on the streets but we were asked not to purchase the food that you couldn’t peel and wash. 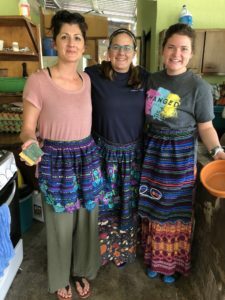 The Guatemalan culture is very beautifully colored and we were able to experience them today. Movement though the market was slow as the locals pushed past you bustling on their way to gather their weekly supplies. 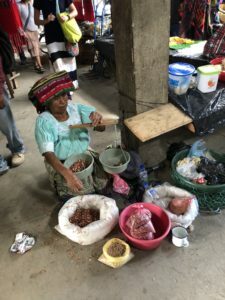 Dried chilis, whole cloves, dried fish, fresh shrimp, unfamiliar fruits, salt, green onions, tomatoes, cabbages and other goods lay upon tarps on the ground. 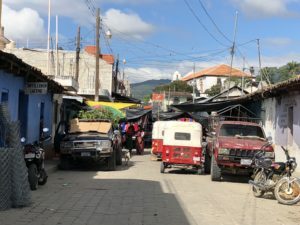 Locals and those from the surrounding Adelas (rural mountain villages) around San Andres sat cross-legged bartering their goods. 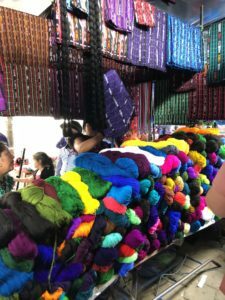 Woven baskets and fabrics used as tortilla towels, shawls, and skirts hung down from poles. There were also imported goods similar to a flea market and pharmaceutical drugs; some in unmarked packages. This market truly held an overwhelming diversity of goods. 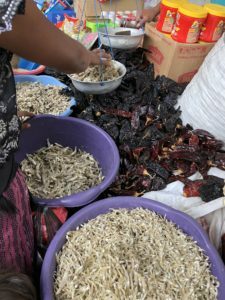 Dried Fish as a snack. Bartering for tortilla bowls and wraps. 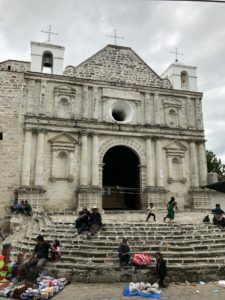 A church in the city center. The team came back with fabulous purchases to bring home as memories and gifts. 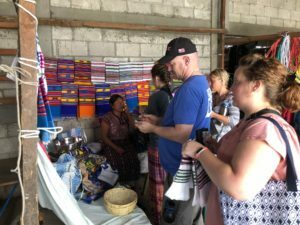 These included tortilla baskets with cloth wraps, colorful traditional aprons, San Andres Sajcabaja shawls, plastic woven bags, and beaded headbands. The men were amazing at making sure everyone was accounted for and making sure that everyone was safe. Also, VERY patient with the women who were eager to shop and shop and shop! All in all, it was a beautiful day, graced with sun, mountains and the beauty of this culture.